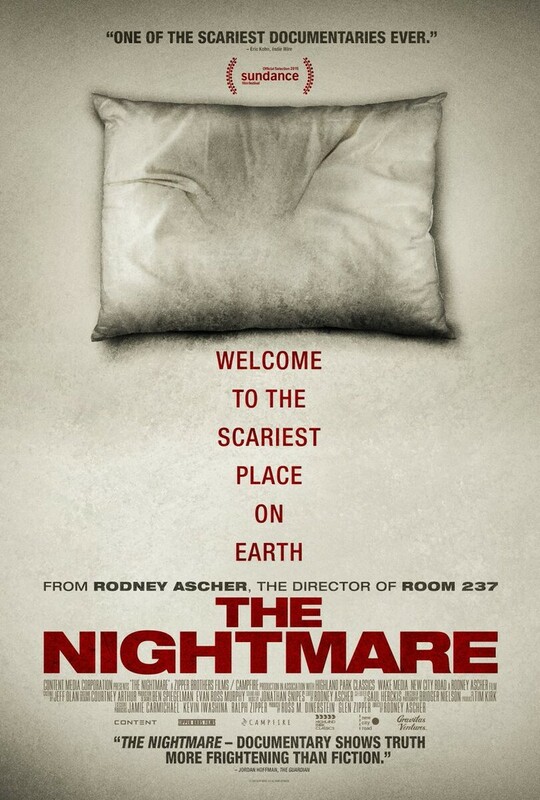 “The Nightmare” (2015) A documentary about sleep paralysis. Directed by Rodney Ascher. It features interviews with people who suffer from sleep paralysis, and the nightmarish hallucinations that accompany them. The music is very effective throughout the film, though sometimes ambient sounds are used. The film tells the story of eight people and what waits for them in the darkness. Jeff was talking with his girlfriend about paranormal stories and she mentioned to him how sometimes she woke up in the middle of the night unable to move or breathe. She felt like an evil presence was in the room with her, and that it was there to torment her. But when she woke up she realized that it was only a dream. A week later he went to sleep and suddenly felt his body extremely heavy it was like he was asleep but awake at the same time. His body started tingling and it felt like something was pulling him. He heard a terrifying sound like a washing machine and started seeing things that looked like a laser light show of colors shooting at him. He had zero control of his body, and had a panic attack thinking he was dead. He later told his girlfriend that and she mentioned to him that’s what was happening to her so he decided to go to a doctor. Elizabeth was 29 when she experienced sleep paralysis. She was sleeping and woke up, as tingling and a sound like bees buzzing started in her feet and rose up her legs, her torso and hands. Her mind was awake but her body was stiff. There was a tapping on the window, like someone knocking to be let in. When she looked towards the window it stopped, but after a while she felt a presence next to her trying to take her soul away, and her body was paralyzed and she felt like she was floating in the air. When she was pregnant with her daughter she felt the baby was trying to come out so she pulled back and it would pull her the other way. When Kate was in her 20’s she had a bad breakup and started her first teaching job at the same time, which stressed her out. One night she woke up and saw a dark figure standing by the bookshelves in her room. She could not move, and she lived in the top floor with her roommate, so no one could easily get into her house and that terrified her. When she was three years old, there was an orange nightlight near her crib. It was all dark in her room except for the nightlight. The room suddenly turned red and she felt like something was coming after her and she covered herself as a means of protection. It’s her earliest memory of what’s still happening to her. She would lay down, exhausted and everything was shutting down except her consciousness. She felt an electrical kind of vibration and began hearing voices, screams and crying, all negative emotions. Then the shadow man would come toward her. It looked like a 3-dimensional shadow that walked disjointed; the vibration came from him. She tried to scream but couldn’t. When you start to fall asleep and you get what feels like an electrical shock on your body, it means that you’ll be visited that night. You will wake up paralyzed and there’ll be static in the room and shadows will try to touch you. One particularly menacing shadow man called The Hat Man seems to be in charge of the other shadow creatures. He has two lives. The first one is when he’s awake. The second one is when he goes to sleep. His bed had collapsed onto a box of beanie babies, so the bed was pivoted with his feet closer to the ground. His sleep paralysis started and he remembered seeing darkness and shadows that looked alive. A being came in to his room and it looked like a faded version of a shadow man, but it wasn’t doing anything. He thought they were real, however, when he woke up they weren’t there. Connie experienced sleep paralysis when she was either five or six years old and later when she was 15. She was spiritually broken and lived in a two-story home in Torrance. In the middle of the night she felt an evil presence behind her on her left side, she tried to move but couldn’t and was frozen in terror. He was raised in rural Vermont and lived in an old farmhouse. It was very dark and quiet at night there. When he was a baby he woke up and couldn’t move, and above him at the end of his crib there were two tall, thin anthropomorphic beings with cartoonish faces. They tickled him and laughed at him, and he woke up in a panic. After that happened, he wouldn’t sleep in his crib. Some of these interviewees researched what was happening to them and found out it was sleep paralysis. Sleep paralysis occurs when you slip between phases of sleep and being awake. You are unable to move or speak, and some people report the feeling of choking or hallucinations, such as what the interviewees of “The Nightmare” experienced. Many cultures throughout the ages have folklore associated with sleep paralysis: such as the night hag, incubi (demons) and modern tales of alien abduction and visions of shadow men. Whether they are hallucinations or actually occurring phenomena doesn’t matter, because the people who experience this are terrified. After a period of dry spells where their sleep was uneventful and peaceful, the sleep paralysis came back. Connie saw black blobs coming on to her bed. Her roommate was near her but she couldn’t call out to her because she was paralyzed. Chris was 10 when the sleep paralysis happened every day. He felt pressure on his chest and stopped breathing. He had two options: get out of the paralysis or breathe. Forrest heard voices talking to him, and the voices were different, depending on where he was, and what figures he saw during his paralysis. Jeff thought for a moment his paralysis was over, but one day while he was sleeping it came back and he got out of it. Then, he went back to sleep and his phone rang. When he answered someone on the other end said hello and asked him to him them a favor and let them in. Terrified, he threw his phone away from him. Everything went into chaos and it felt like something was pulling his soul out of his body. He started praying and then someone grabbed him from behind and slammed his soul back into his body. It was a very vivid dream, and he isn’t sure if it really happened or not. SILVER SCREEN MEMORIES OR HALLUCINATIONS? The things we see in movies and on TV can be seen in our dreams. Since sleep paralysis can occur during different stages of sleep, it is likely that paralysis occurs while the brain is still dreaming, and it is conjuring up images, sensations and sounds that the mind remembers from watching a movie or scary TV show. Korinne often dreamed of Freddy Krueger, and that he wanted to scare her, because fear creates a substance, like black ink, that sleep paralysis creatures consume. Freddy Krueger wears a hat and in one scene in the original movie, his shadow is thrown on a wall in an alleyway, and it’s a shadow of a man with a hat. There are similarities between that haunting image from the movie and people’s reports of Shadow Hat Men. 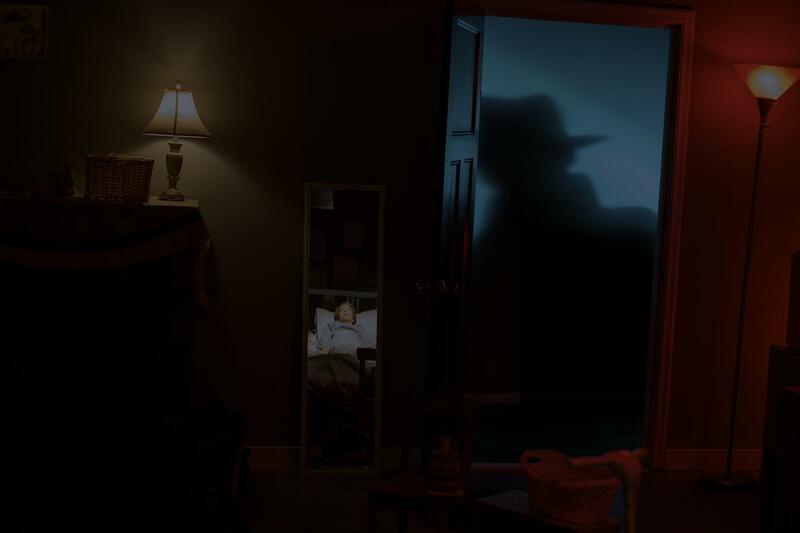 The fact that most reports of Shadow Hat Men sightings occurred during the age of the Internet, it is highly possible that our subconsciousness has picked up on that image from “A Nightmare on Elm Street” and letting our imaginations run wild so that we actually see a Shadow Hat Man, when what we’re really doing is hallucinating and reliving a memory from a movie. Several of the interviewees recalled seeing things on TV or in the theater that were similar to images they saw during sleep paralysis. Forrest mentioned having HBO, and he watched “Communion” with his dad. “Communion” is a horror movie about a man who is abducted by grey aliens. It’s based on the book of the same name, written by alleged alien abduction survivor Whitley Strieber. The aliens in that movie caused him to draw a parallel in his mind to what he saw when he was a kid, and he thinks that he saw a face of one of those grey aliens from the movie. 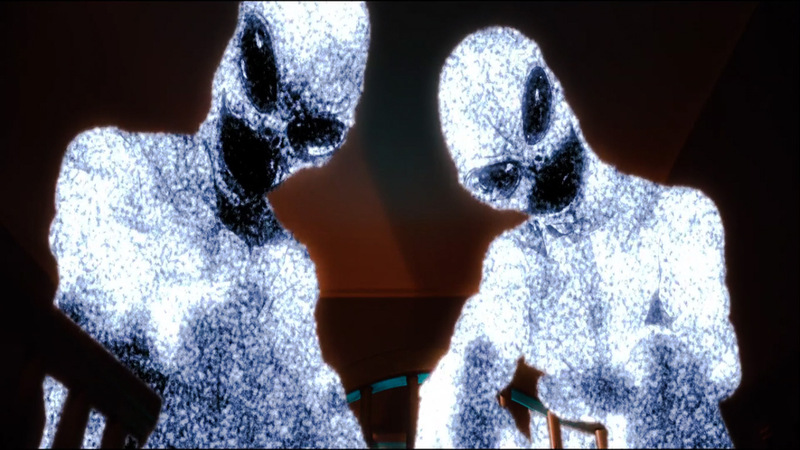 Forrest also believes that he had a psychic connection to his abductors (the aliens). Chris thought that “Insidious” was actually about sleep paralysis and that events in the movie are a direct representation of what he felt when he experienced sleep paralysis. For a little while he used to sleep with the TV on, and that seemed to stop the sleep paralysis, but only temporarily. When it happened again, he used two TVs. Having them on seemed to stop sleep paralysis for a bit, but it was only a temporarily solution. Korinne is a spiritual person whom prayed a lot, but it didn’t stop the episodes she experienced. Anna went to a tarot card reader and was told by the reader/psychic that they couldn’t look into her house to see what was going on there. It was covered by a shadow. Her sleep paralysis felt like a creature was climbing onto the bed and sitting on her. During sleep paralysis, Chris experiences pain which tied to the hallucinations. When they became more vivid, the more it hurt and the more he was able to interact with it. During one of his worst episodes, he got up and he walked through a different world full of stairs. He ran into a kid who called his name, when a giant with orange hair appears, the kid left. Then something happened and he felt intense pain, like a claw machine was attacking him and the pain continued as he slowly woke up. One of the girls whom spent the night with him said that she woke up screaming and saw a cat with red eyes. It was looking at Chris and speaking a language she couldn’t understand. It was sitting on her, but it was threatening him. After that Chris was desperate to figure out how to stop it from happening again. Kate thinks that we conceptualize things in our consciousness based on pieces of information that we pick up along the road somehow. For example if she came from an Evangelical community where they believed in demons, the immediate association from her subconsciousness would interpret what she is seeing as the Devil as she’s waking up. Chris believes that we’re over-clocking our brain more during sleep paralysis than when we’re just sleeping or awake. It’s a heightened sense of awareness and we can’t interpret what we’re experiencing so common archetypes are seen during those episodes. Such as a red-eyed demon, a shadow man or a cat sitting on someone’s chest. Some people have died during sleep paralysis, which is where the concept of Freddy Krueger being able to kill you in your dreams comes from. The physicist Michio Kaku said that we don’t live in just one, but in multiple dimensions. Imagine a block of flats (apartments) as an extension of you. They grow all the time and never stop. In every room of this block of flats is a universe like ours, and every other room in all the other universes are based on it. Maybe some of the people who live in the other dimensions have found a way to come over to our dimension. Sleep paralysis could actually be caused by our consciousnesses travelling to other dimensions, or they could be visits by beings from other worlds. After her mom died, Anna was very depressed. She had a total breakdown and cried a lot. After working a night shift, she felt asleep on her side looking at the bedroom door. Her body went numb and became paralyzed. She heard someone walking. It was a presence that came behind her and hugged her. She felt like it was her mother telling her, “Honey I’m here.” She felt warmth and happiness. It happened two or three times but she questions if it was really her mother or the presence that was haunting her from before. Stephen had an experience that stands out from the others. He and his girlfriend went to bed, but since he wasn’t tired, he started playing with his phone. He fell asleep while he was playing a game and when he woke up he was on the side of the bed, in an oppressive atmosphere. He turned around he saw his girlfriend and his own body in the bed. He had his eyes open and was trying to breathe, like he was having a paralysis attack. As that’s happening, three beings on the corner of the room were watching him. Two shadow people advanced towards him and grappled him. He fought them off and they retreated and a hat man stepped between him and the others to shield them from him. The Stephen saw a silver thread going towards his body, so he went back to bed and woke up. It is believed by some that practice astral projection that the soul is connected to a person’s body by a silver umbilical cord. When the cord is severed, the soul moves on and the body dies. He went to the kitchen to get something to drink and felt guilty about leaving his girlfriend with the shadow people, so went back up to the bedroom and stayed up for the rest of the night while she slept. Stephen thinks this won’t get better for him, and there’s no reason as to why is this happening to him. It just is. Connie heard a loud noise, like listening to spirits or demons screaming. Then a buzzing happen and she felt a presence standing next to her. It screamed in her ear and she saw the color red. She wanted to look at it, but she couldn’t move. It screamed in her ear. She saw the color red and tried to look but couldn’t move. She said. “In Jesus’ name get out!” (or something like that), and suddenly the presence left and never came back. She wasn’t a Christian then, but she is one now thanks to that experience. Connie believes that it has to do with a spiritual realm of some sort and that sleep paralysis is connected to demonic activity — which is similar to many folk beliefs across the world. She talked about her experience with sleep paralysis on a YouTube video, and has been sent other videos (or video responses if you’re hip to the Youtube game) but she wasn’t ready to see them because it was in her past. Korinne grew up in an abusive household and was beaten throughout the day, so her soul had to heal at night. That’s why she could get through the fourth dimension, she needed to be there to be healed. They decided to be receptive while standing in it, his girlfriend closed her eyes while standing and suddenly mentioned “something’s coming.” Forrest looked towards the forest and out of it came a blue form; started approaching them but it was peaceful and pretty; different from the dark figures he had seen before. He turned around and saw the face of the one that he saw when he was a child. He was told that fear empowers bad things, and then the blue spirit dissipated. Chris had one episode where he thought he was going to die. The dream was happening normally then suddenly there are knocks on the door and two homeless people tried to get in. There’s a roller blader in the background and comes towards him and pulled a gun on him. He couldn’t see anything, and he became nervous and yet serene at the same time. He called out to his ex-girlfriend, and no one came. 10 minutes later he woke up. He feels that it could get worse, and he’s scared that one day he won’t wake up. But, in spite of this he wants to know more about his paralysis and will continue to research it. Is sleep paralysis a dream-like state where someone can’t move and hallucinates? 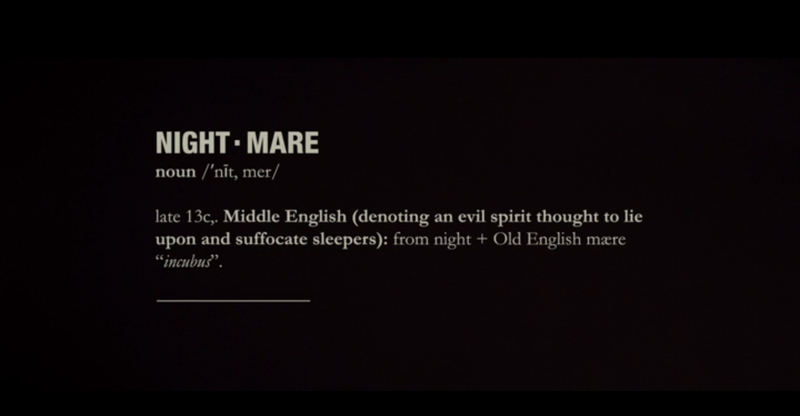 Or is it something more sinister and supernatural in origin? What do you think? Weird Musician makes Let's Play videos of retro and indie video games, as well as Band and Music reviews for his Vidme Channel, which you can find here: https://vid.me/Weirdmusician Stop on by his channel and say hi! Tagged A Nightmare on Elmstreet, alien abductions, aliens, astral travel, Communion, demons, grey aliens, Insidious, Mothman, multiple dimensions, night hag, nightmares, red eyes, shadow hat man, shadow men, Sleep Paralysis, The Nightmare, Whitley Strieber. I’m watching this documentary and I have the same disorder. An electrical current runs through me and it’s ice cold and I can’t move and the tall man. A tall slender dark figure comes out. And I feel pressure. On the from but to the point that my lower middle back is in pain and I call out but I can’t say anything. Since I was 10. I slept with a bible in my room. It got so bad that I was in a dream and the tall man pulled me out of it and I was flying and I could see the freeway and my house and then my bed where I was and I got put back in my body and taunted and the pressure started. Why? Does anyone have answers? I’ve heard of you calm down you can go into lucid dreams, but I can’t. The demonic presence is felt and I freak out. My thoughts, for what they are worth, revolve around the hasty way in which people relegate this phenomenon to the dustbins of “explained.” Just because we can dissect an eye and describe the mechanism of seeing doesn’t mean that there is nothing to see. We don’t understand the mind and how it works in daily reality, let alone how it interacts with different dimensions. “Sleep paralysis” make be the mechanism by which people are getting real information.